February 4, 2012 By This post may contain affiliate links. 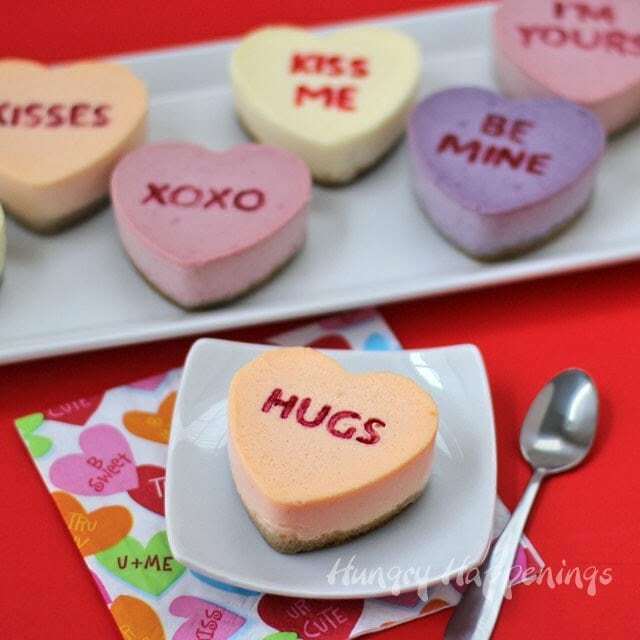 This Valentine’s Day tell your sweethearts how you feel by adding personalized messages to brightly colored, rich and creamy, Conversation Heart Cheesecakes. This fun twist on a holiday classic is sure to win the hearts of your loved ones. See the new Video Tutorial at the end of this post. I’ve heard people, including my husband, say, “I’ve never met a cheesecake I didn’t like.” Well, I can’t say the same. I’ve been known to pay upwards of $10 for a slice of cheesecake and take one bite and shove it aside. To me, cheesecake should be lusciously creamy and smooth with a bit of crunch from the graham cracker crust. I love when it just melts on my tongue. It should taste delicately rich with just a hint of tang from the cream cheese. I wont settle for dense, spongy, crumbly and or sour cheesecake; it better be good if I’m going to indulge. If it’s not perfection, I don’t want it. Well, I have the perfect cheesecake recipe for you. Many years ago, after many failed attempts at finding a cheesecake with just the right texture and taste, I discovered Tyler Florence’s Ultimate Cheesecake. It is the best I’ve ever tried. I’ve used his cheesecake recipe dozens of times and my family and friends all rave out it. You can imagine how they reacted when I turned that wonderful dessert into cute Conversation Heart Cheesecakes for Valentine’s Day. Each sweet little dessert was brightly colored and personalized with a special message printed on the top just like the candy conversation hearts. The cheesecake hearts made for the perfect ending to a lovely Valentine’s Day meal. These desserts are really fun to make and only take about an hour of actual prep time, but do require several hours, from start to finish. You need time to bake, cool, freeze, un-mold and decorate them before serving. Each of the cheesecakes is colored pink, orange, yellow, blue, purple, and green using food coloring. 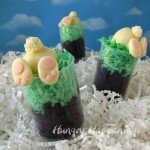 You can use the liquid food coloring your find in the grocery stores or any icing or candy coloring you might have on hand. Just be aware that the color will intensify as the cheesecakes bake. If you prefer to use natural coloring, you can either purchase bottles of natural food coloring or use fruit and vegetable purees. A few years after making my original Conversation Heart Cheesecakes, I created a batch of naturally colored conversation heart cheesecakes using fruit purees (pictured above.) The cheesecakes are flavored and colored with blueberries, raspberries, lemon, and orange/carrot. If you enjoy fruit flavored cheesecakes, this is a wonderful, natural, alternative. They taste great and, although the colors are a bit more muted than the original cheesecakes, they look equally festive. You will also notice, the lettering on those conversation heart cheesecakes is a lot nicer. Check out the other tutorial to see how to achieve this really clean look using cookie stamps. 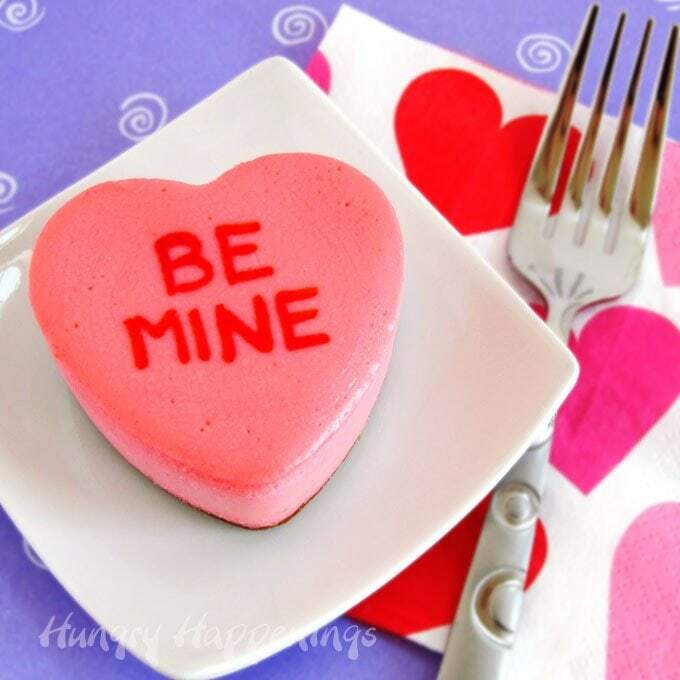 To make these heart shaped cheesecakes, you will need three Wilton Heart Shaped Silicone Molds. The molds are the perfect size to make an individual serving of cheesecake. I only had 2 of the molds at the time I made these hearts and ended up using the extra cheesecake filling to make some mini cheesecake hearts. The bite sized treats were cute, but I would have preferred having 3 of the larger hearts in each of the six colors. You will need a water bath to bake your cheesecakes, so either place your roasting pan in the oven filled with enough water to go half way up the sides of your heart molds and allow the water to heat along with the oven or bring some water to a boil in a tea pot or the microwave then pour it in the bottom of the pan. My roasting pan has a flat rack that fits inside. I set two heart molds on the rack, filled them, then used the handles to help me lower the molds into the hot water. After the cheesecakes bake it’s so easy to lift them out and cool on the rack. Once you have your molds ready to fill, equally divide a mixture of graham cracker crumbs, butter and cinnamon in the bottom of the heart shaped cavities. You’ll use about a tablespoon of crumb mixture in each heart cavity. Press the crumbs down making an even crust. Refrigerate until ready to fill with cheesecake mixture. You can bake this crust for 8-10 minutes, if you want it to be a bit more crisp. Either way works fine. In the bowl of a stand mixer, or in a mixing bowl using a hand held mixer, beat the cream cheese on medium high until smooth, scraping down the sides of the bowl as needed. Be sure to scrape the cream cheese out of the mixing blade as well. You don’t want lumps in your cheesecake. Add sugar and beat for one minute. Add eggs and beat until creamy, 1 to 2 minutes, scraping the sides of the bowl once. Add the sour cream and vanilla and mix just to combine. Equally divide the filling among 6 bowls. Add food coloring to create the colors you’d like. The colors will intensify a bit once baked, so make them a little less bright than you want them. I was not happy with how intense the blue cheesecakes turned out. I would only a few drops of blue. 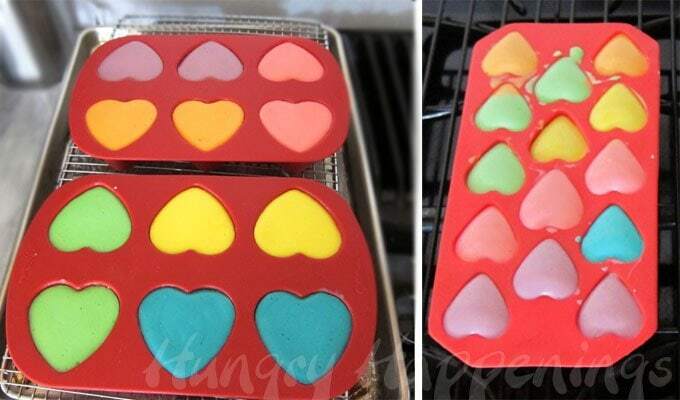 Pour the colored cheesecake filling into the heart shaped cavities in your Wilton silicone molds. If you are using 3 heart molds and making 18 cheesecakes, equally divide each color among 3 hearts. The cavities will be a little over 3/4 full. Bake cheesecakes in a water bath for 18-22 minutes. When baked thoroughly, the cheesecakes should still jiggle, but not look wet. 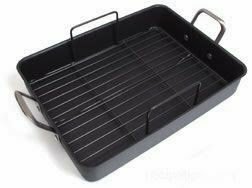 Use a roasting pan with a removable rack to make it easier to remove cheesecakes. You can set your heart molds in your roasting pan, then carefully pour boiling water around the heart molds. If baking tiny cheesecakes, bake for 10-14 minutes. If you bake one large heart shaped cheesecake, it should take between 42-50 minutes. Remove your baked cheesecakes from the oven and water bath and allow them to cool at room temperature for an hour. Then cover the mold with a piece of paper towel and wrap in plastic wrap. Freeze for at least 2 hours or up to several weeks. It’s easiest to remove the cheesecakes if they are frozen solid. Remove from freezer, uncover, then push on the underside of each heart mold, releasing the cheesecakes. Carefully lift them out of the mold. If they don’t pop right out, you need to freeze them longer. 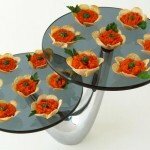 To add the conversation heart phrases, squeeze a few drops of red food coloring into a small bowl. 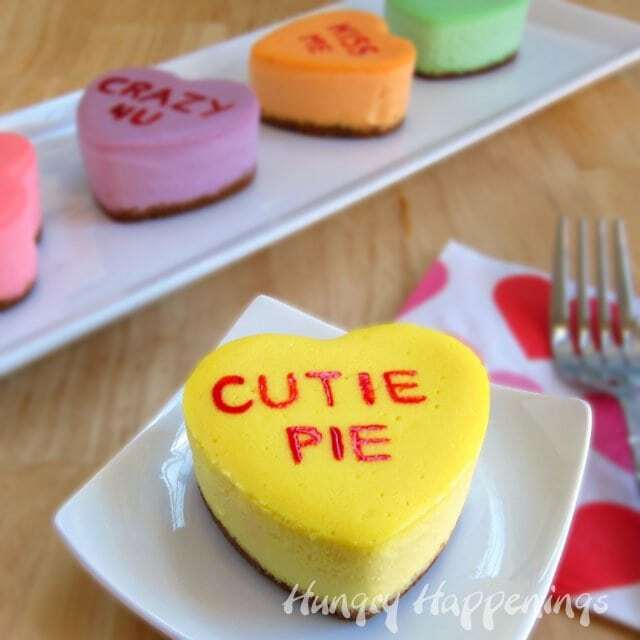 Use a fine tip paintbrush to paint the words onto each cheesecake heart. Traditional conversation heart sayings are printed in all capital letters. Don’t worry if your words are off center, as many conversation hearts are printed that way. If you have too much food coloring on your brush, your letters will bleed. The food coloring will dry if you refrigerate your cheesecakes for a while. Store in the refrigerator for up to several days or freeze for up to a month. I suggest storing them in an airtight container. To keep the condensation from developing on the tops of the cheesecakes, set a piece of paper towel, that is larger than the container’s lid, across the underside of the lid. Close and seal. The moisture will get wicked up by the paper towel. 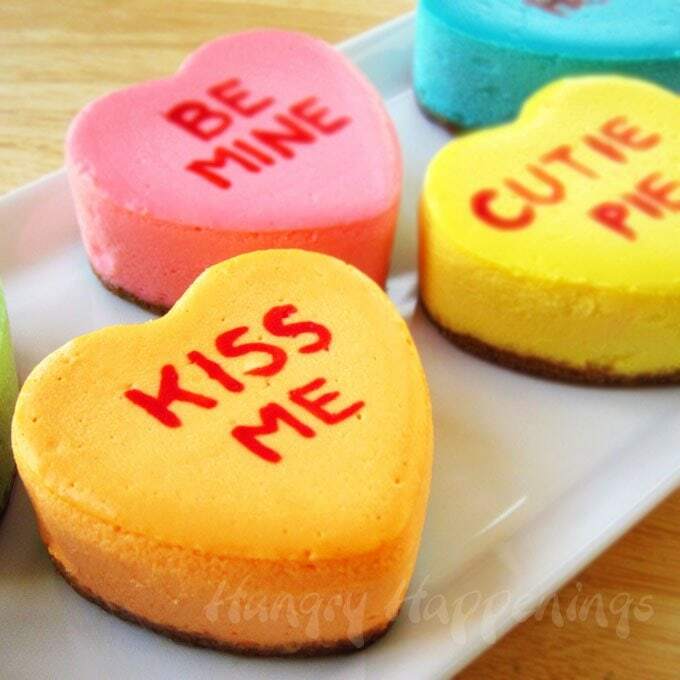 Brightly colored heart shaped cheesecakes decorated to look like conversation hearts. Fill a roasting pan with enough water to come half way up the sides of the silicone heart molds. Heat oven to 325 degree Fahrenheit. Mix together the graham cracker crumbs, cinnamon, and melted butter. Equally divide the crumbs among 18 heart shaped silicone mold cavities. Press the crumbs into an even layer and refrigerate until needed. Beat cream cheese until creamy and smooth. Beat in eggs then add sour cream and vanilla and mix just to combine. Equally divide batter into 6 bowls. Color one bowl of filling pink,another lavender, yellow, orange, green, and blue using food coloring. Equally divide each color of filling among 3 heart cavities. Bake cheesecakes in a water bath for 18-24 minutes until the edges look set but the center is jiggly but not wet. Remove from oven and water bath and allow to cool at room temperature for an hour. Freeze for at least two hours then remove and un-mold. 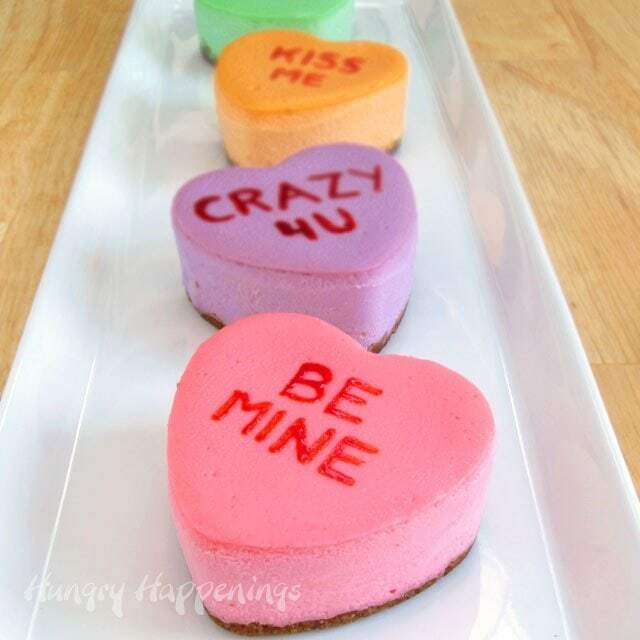 Paint conversation heart phrases onto the tops of the cheesecakes using red food coloring. If you’d prefer a naturally colored version of this Conversation Heart Cheesecake recipe, check out my tutorial and recipe for heart cheesecakes colored using fruits and vegetables. In that tutorial I will show you how to imprint the words using stamps to make a nicer looking design on top of each cheesecake. Here’s a video tutorial. You’ll notice I made pastel colored conversation heart cheesecakes. I used 1-3 drops of food coloring to create these pretty hearts. 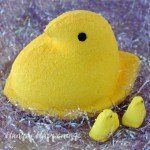 Hi Beth – these are so darn cute! Love, love, love, love, love them!!! Fabulous photos too – so glad you documented the process for us. Will have to keep these in mind for the family – I make all kinds of cheeseake, but none as impressive as these little cuties. I'm off to check out more of your blog. 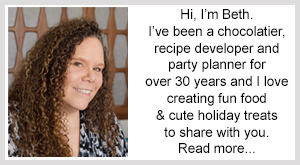 PS – I use my BeaterBlade attachment in my KitchenAid to make cheesecake. No scraping of the bowl required. Love it! genius!! love this!! great job with the colors. Wow, Beth, great job! Those turned out just fantastic! I love them, can't wait to try them. Thanks so much for the excellent idea! 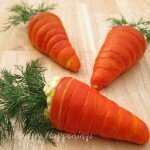 Just saw these on foodgawker – they are AMAZING! I love the silicone molds – they're so easy to work with, but have never used ones for cheesecake. Thanks for the freezing tip for getting them out. Love, love these. I just found this page by accident and am glad that I did. I love baking cheesecakes and can't wait to try these. My daughter is getting married on March 31 with just a few friends and family so I thought I would make one for each of the guests. I will try them out on others first though just in case mine don't turn out like yours. lol I can't wait to go and check out the rest of your page. Thanks once again. This is amazing! What a great idea! I love any and all things cheesecake, so Im definitely going to be making these! Pinning them now! 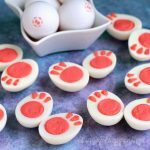 I just saw these on foodgawker – adorable idea! Thanks Mandy, I'd love to post your pictures in my Reader's Gallery along with a link to your blog. Have fun in the kitchen and enjoy your party. WOW! These are awesome! There are so many cheesecake possibilities with using different mold shapes! Love the colors!!! I really appreciate being featured Natalie. Thanks! Thanks for your recipe/method, these are so colourful and appealing. Shared your "link" to my recipe exchange on Facebook. What a great idea, and what a good use for the heart shaped pan! Thanks Heather. I've had those heart pans for years and this is my favorite use so far. Thanks so much Kristi. It's nice to hear how much my effort is appreciated. I spend more time than I ever imagined I would on my tutorials, but I love it. I linked up on your site and grabbed your button and added it to my Featured On/Linky page. 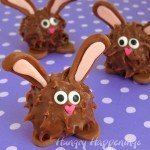 These are so adorable I can't stand it! Thanks Connie. I love the name of your blog! Oh Jill, you are so right. I am a total perfectionist. I spent a few hours this afternoon working on my next Valentine's Day recipe, but wasn't totally happy so I'm re-doing it again tomorrow. I'll be sure to stop by your linky party on Friday.